All presentations will be presented POSTER style. The detailed requirements and formats for the poster presentation are as follows. The size of each poster presentation space is twice of 90cm width and 210cm height boards (total width is 180cm). 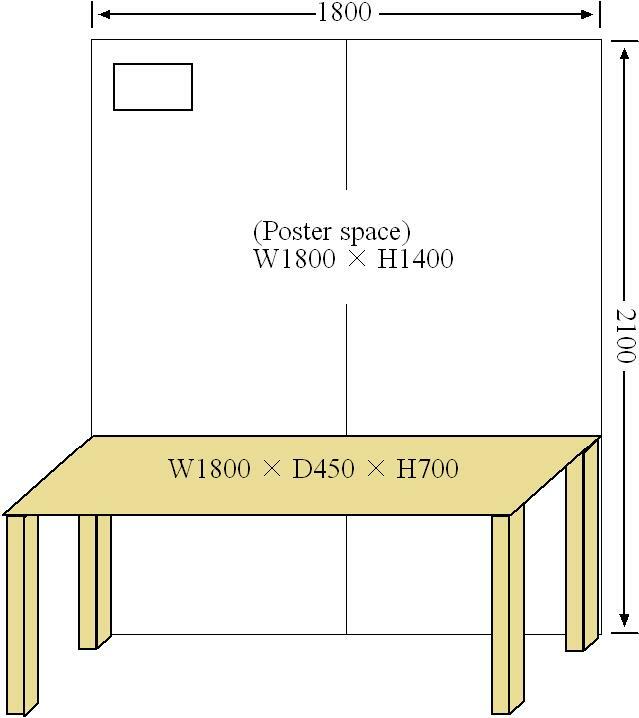 A desk (180cm width, 70cm height and 45cm depth) is available for each presentation in front of the poster board. Cellophane tape is prepared at the poster presentation hall. NO PINS OR DOUBLE-SIDED STICKY TAPE AVAILABLE for protecting the board surface. Poster presentation site is the 3rd exhibition hall. 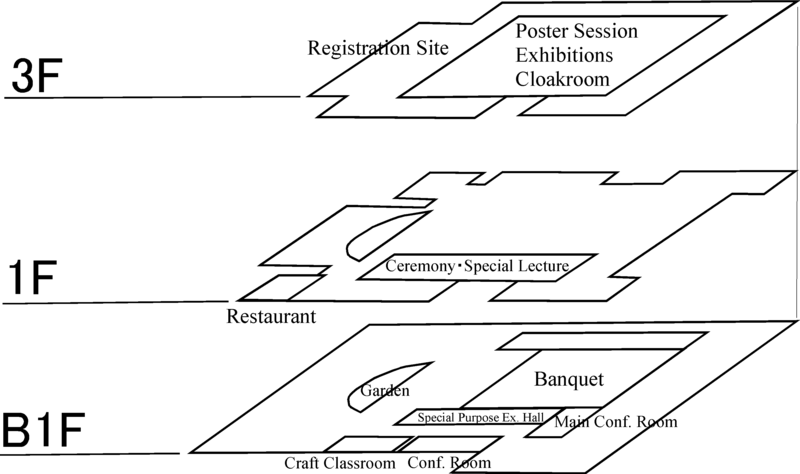 The layout of each presentation can be available on this PDF. Each session has 90 minutes for presentation. Each session divided into the first half (45 minutes) and the second one. 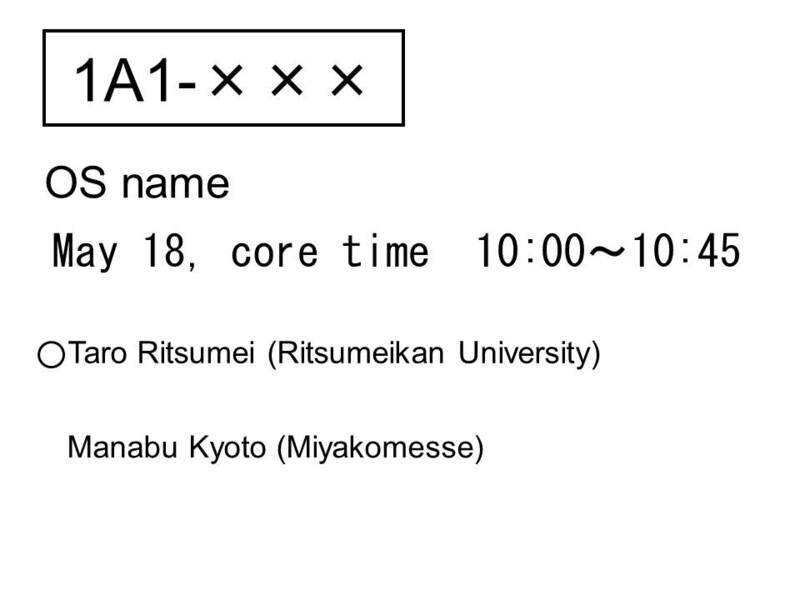 “Core time”, the presenter should be in front of his/her poster in the duration, is scheduled for each presentation. The first half for the odd-number presentation and the second half for the even-number one. Presenters can paste their poster on the designated board from 30 minutes before the session start. Complete pasting before the session start. Remove the poster as soon as possible when the session finishes. Any posters left on the board 20 minutes after session end may be removed by staffs. 100V(2A) electricity is available for each presentation. Prepare extra cables or taps by your self if you need. All delivery of any devices or PCs for your presentation should be cared by yourself. NO OFFICIAL DELIVERY SERVICE AVAILABLE. Officials may stop the demonstrations when it disturbs other presentations by its annoying sound or any dangerous situations. NO STOCK SPACE AVAILABLE. Any posters or devices can not be acceptable at the conference venue before session. © 2014 - 2019 ROBOMECH2015 The Robotics and Mechatronics Conference 2015 All rights reserved.